Raith Rovers' questionable promotion credentials were underlined by this woeful home defeat to Stranraer. Two-nil ahead after half an hour, the Kirkcaldy side should have been able to see the game out comfortably against the relegation-threatened part-timers. Instead, the season-long issue of weak defending resulted in the lead being wiped out by half-time, before a stagnant second half culminated in Stranraer scoring an injury-time clincher to complete the comeback and claim their first league win at Stark's Park since 1984. For the visitors, this was Roy of the Rovers stuff, and their remarkably spirited performance will go a long way towards maintaining their League One status. But for a Raith side still hoping to play in the Championship next season, this was, once again, nowhere near the required standard. Injuries are unquestionably impacting the side, with five regulars missing and another two dropping out of this game, but the team that both started and finished the 90 minutes should have been capable of much better, with only schoolboy Keiron Bowie absolved due to inexperience. Most worryingly, Stranraer were the team that showed more will to win in the closing stages with fans leaving the players and management team in no doubt about their feelings as the boos bellowed down from the stands at full-time. Typically, on the day Arbroath got the point they needed to become champions, Raith's defeat would have clinched it for them anyway - and that has been the story of the season. Rovers made three changes to the side that started the 1-1 draw with Stenhousemuir the previous week, and two were enforced. Crocked goalkeeper Robbie Thomson was replaced by Dean Lyness, while Iain Davidson returned for the injured Grant Gillespie. Liam Buchanan was also restored to the starting 11 as on-loan Hibs forward Jamie Gullan dropped to the bench. Rovers made the perfect start, leading inside four minutes as Dave McKay's back post header from a Jamie Barjonas corner found its way over the line for his first senior goal, only to be met by muted celebrations with most of the home fans at the opposite end of the stadium not realising the ball had crossed the line. Despite suffering an early setback, Stranraer were causing no end of problems at the other end, particular Portuguese front man Joao Vitoria who had the entire defence on eggshells with his sharp movement and direct running, and he was just wide with an effort on 10 minutes. There was a let-off for Rovers on 25 minutes when Vitoria took out three defenders with a quick turn, and his cross found Innes Cameron unmarked but after chesting the ball down, the on-loan Kilmarnock striker volleyed high over the bar. If Raith were looking shaky at the back, then so too were the visitors with the Rovers front men finding space in behind. Kevin Nisbet forced Max Currie into a flying save after cutting in from the left, while several other promising positions were spurned. A mistake in the Stranraer defence eventually led to Rovers' second goal as Jamie Hamill allowed Nisbet's pass to roll under his foot, giving Barjonas a clear run on goal and the on-loan Rangers midfielder showed good composure to stroke a measured finish beyond Currie into the far corner. Rovers looked capable of scoring with every attack, but the same could be said of Stranraer, and sure enough, they got back on level terms a two-goal burst before half-time. First, on 41 minutes, Cameron Elliot cut through the left-side of Raith's defence with ease - an area of concern in recent weeks - and squared for Kyle Turner to force the ball through the legs of Lyness. Worse was to follow three minutes later when Lyness came off his line at a Mark Lamont corner, got nowhere near it, and Cameron sent a downward header towards goal that bounced up into the roof of the net. For all the good attacking play at times, the soft centre of this Raith team had once again been exposed. Despite the order of the scoring, 2-2 was an accurate reflection of a first half between two teams that appeared incapable of defending properly. Both teams looked to address this in a less open second half, but the longer it wore on, the more it became apparent that Stranraer wanted the points more. 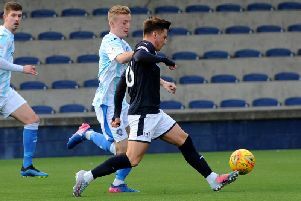 While injuries to Nat Wedderburn and Nathan Flanagan disrupted their shape, there was no excuse for Raith's sluggishness and overall lack of bite. It took the schoolboy substitute to create Raith's best chance of the half as good work from Bowie on the right was followed by a pull back that found Euan Murray completely free six yards out but, off balance, the skipper could only fire wide. The second half was summed up in injury-time when Raith looked to launch an attack, only for Callum Crane to give away possession cheaply, allowing the away side to break, and after Cameron's strike rattled the inside of the post, Vitoria was on hand to nod the rebound over the line. With three games left until play-offs, Raith have concern over form, injuries, and after today, confidence. Time is running out for this team to raise their game.